Spicy cabbage.Good morning, one and all.Yeah,some might say what can you really do differently with cabbage other than boiling it ? Well today we hope to inspire you to do this Spicy Cabbage recipe because we here at Home Cooking Haven think we have come up with a winner with this Spicy Cabbage recipe, one of our favourite recipes. We have spoken to many people about this recipe and they seem to agree that this is a winner. I invite all my fellow amateur chefs to try this simple, easy and economical method in cooking this Spicy Cabbage that will send your taste buds to another level. What's really great about this is that it is also diet friendly for those that are on the Banting,'Weight Watchers or The Tony Fergusson diet. P.S.I did a bit of research regarding the Health Benefits of cabbage and was amazed at its Medical Health properties. Okey Dokey if you have see some of our other recipes on home Cooking Haven ,you will see that before I start cooking I always find it easier to get all ingredients at hand so when you start the prep work you don't have to start running around looking for this and that. Right for this recipe,we will doing stuffed curry Spicy cabbage Lamb mince rolls You can use any ground mince, Beef, Pork, Chicken, Turkey, lamb, Mutton, Ostrich, half and half Pork and half Beef. 1 medium size onion finely chopped. 2 tsp.curry paste or 2 tps mix masala (you can use mild ,hot). 2 cloves fresh garlic or 2 tsp. garlic paste. 2 Tbsp.freshly chopped Dhania (2 tsp coriander powder}. 450gr (8 ounce) can smooth tomato soup (dieters use weigh less smooth tomato soup). 1 Tbsp. brown sugar (banters can use xylitol). Optional 1small tub of sour cream(low fat}Banting dieters can use full fat). Cook a cup of rice ( Banting dieters use cauliflower rice) rinse when cook and set aside. 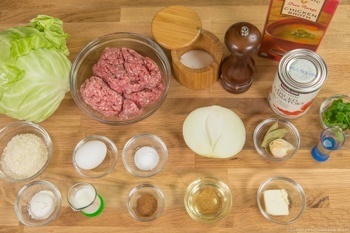 Take a ice cream scope (Large spoon)of meat mixture and place in center of each cabbage leaf..
Place rolled cabbage in your slow cooker with ends facing down. 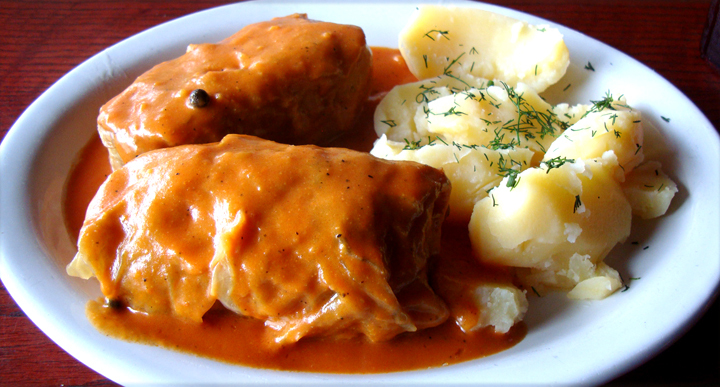 Pour sauce over the cabbage roll . Cover, and cook in your slow cooker on Low for 8 to 9 hours. If you do not have a slow cooker ,Don't worry be happy ha ha ,you can use a conventional pot on you hob(stove). 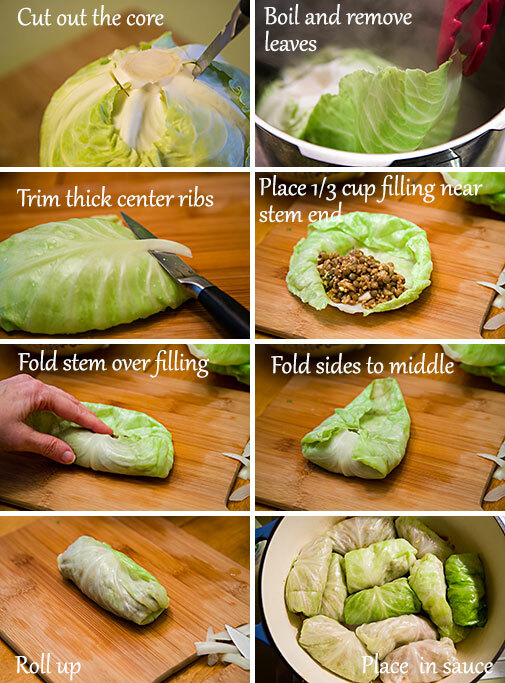 Using your sauce pour a little amount into you pot about ½ cup..
Place rolled cabbage in your pot with the tucked end downwards. 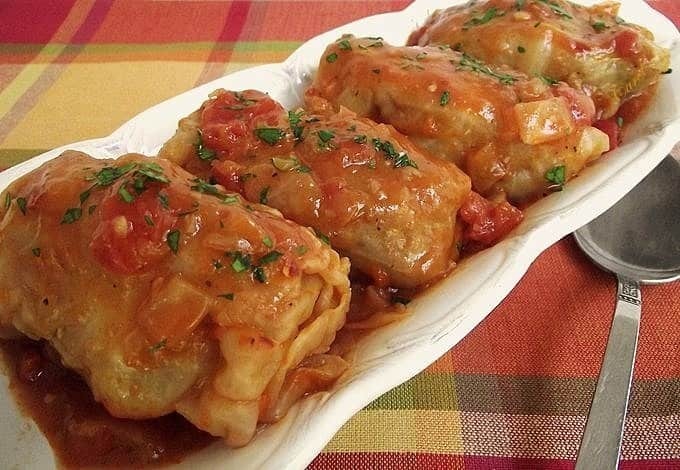 Pour remaining sauce over the cabbage rolls. Cover and cook on medium for 1 hour checking occasionally that stuffed rolls are not sticking to the bottom. Congratulations you have just finished creating a dish that your family will demand at least once a week if not more than once a week. With smooth mash potato's, fresh or frozen peas , green beans or have some mixed veggies the choice is yours.and a dollop of sour cream on the side. And for any South Africans and neighbouring countries, this goes down very well with Pap (Phutu) however you like to make it. 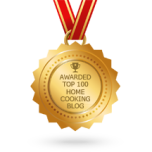 PS we welcome any ideas or any of your recipes you would like to share on this site.